Make your own snow with Froggys Flakes Snow Juice Concentrate Fluid. 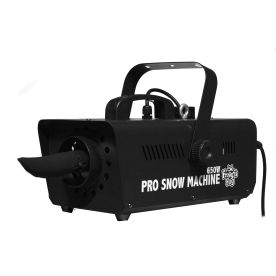 Specially formulated for outdoor settings with the full range of snow machines available on the market today. 8oz of Concentrate makes 1 Gallon Ready to Use Snow Juice. 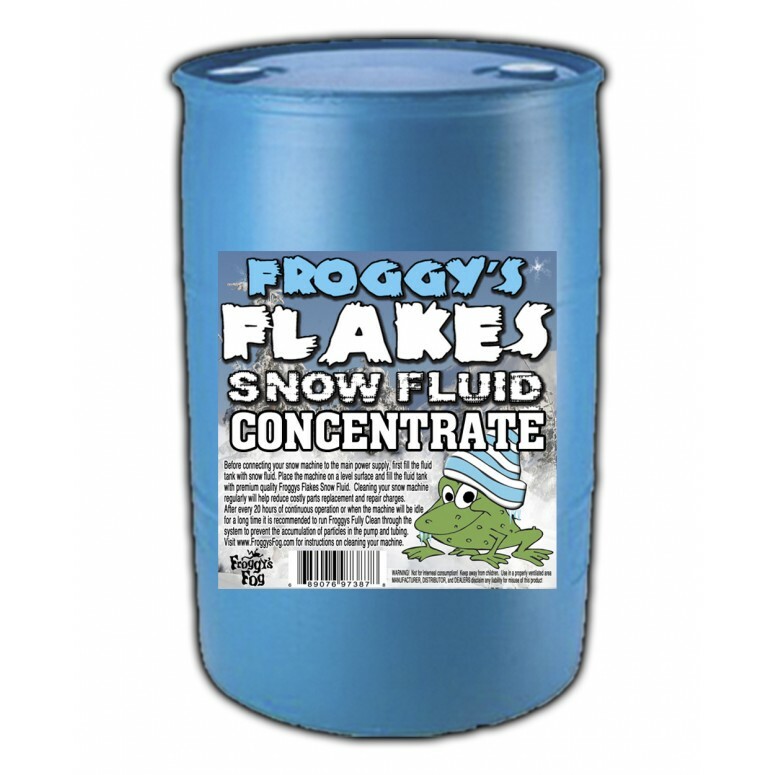 Make your own snow with Froggys Flakes Snow Juice Concentrate Fluid. Times are tough and we did something to help. We took the water out so you will save more on the shipping. You simply pour in 8 oz of concentrate into an empty gallon bottle and slowly fill with water. Gently mix and you are ready to go. This will give you a total of 1 gallon of product. Snow machine required. Non-toxic, non-irritating and non-flammable. Mix ratio is 8oz. of concentrate per 120 oz. of water. 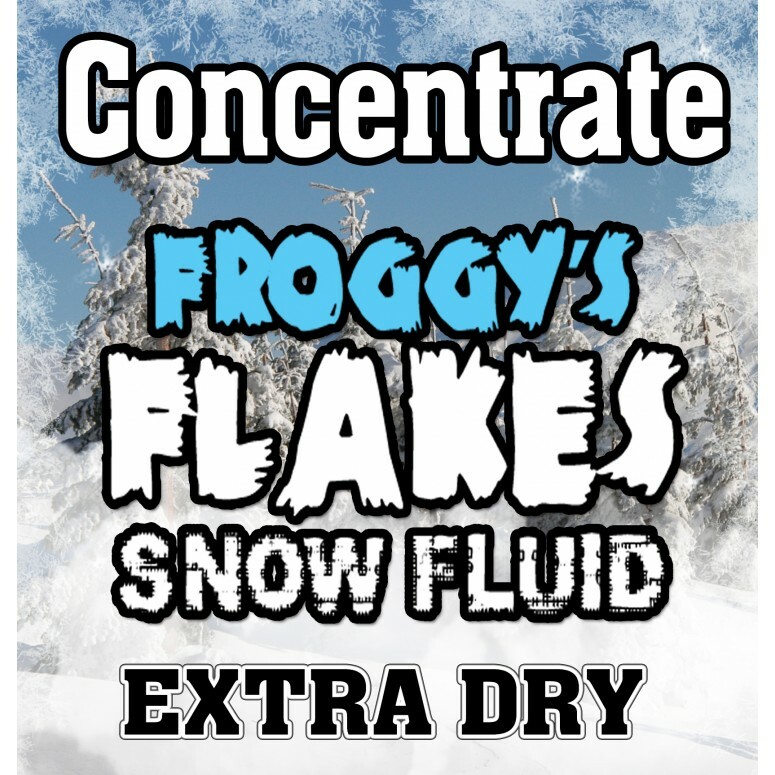 EXTRA DRY Snow Machine Fluid - Froggys Flakes Snow Juice (<30 Foot Float / Drop) Low Residue Formula. When snow flakes are blown less than 30', this is the perfect dry fluid to create snowflakes that float a little longer, evaporating when they finally contact a surface, without leaving a residue (for short falls). Specially formulated for the full range of snow machines available on the market today. Industry Standard Snow Fluid creates a high yield of dense, white, air-born snow ideal for any stage or theatrical setting. Specially formulated for the full range of snow machines available on the market today. Industry Standard Snow Fluid creates a high yield of dense, white, air-born snow ideal for any stage or theatrical setting. Snow will be economical by virtue of being thicker, whiter and longer lasting. Makes a superior flake. Dry and fluffy! No-slip formula. Not harmful to plants, skin or eyes. Safe for kids. High Quality fluid. Water content evaporates leaving a beautiful falling flake that is dry when you touch it and disappears after contact. Perfect for use where dry snowflakes are necessary without residue or mess. This snow flake fluid is for all professional snow machines as well as small home use machines like the Frosty Flake Snow Machine. Running the machine dry will destroy the pump. Storing it for long periods without cleaning it properly can also do so. If a snow machine turns "On", but does not make snow, it is usually the pump that is at fault. An old clogged filter can also limit the ability of the machine to work properly.